A closer view of the FlipScreen BL-60 … and Ron Horner. 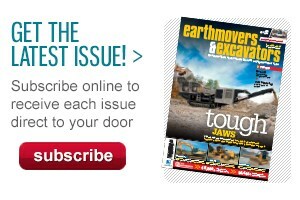 WE'RE VERY keen to promote Aussie innovation at Earthmovers & Excavators mag and TradeEarthmovers.com.au, so I was rapt to receive a telephone call asking me if I would have a look at a clever piece of engineering called the FlipScreen and made by a company of the same name in Wagga Wagga, NSW. Now Wagga Wagga is well regarded as a great irrigation and cropping area, has the fattest sheep and some of the best wool in the country, and is renowned for producing sportsman of the highest calibre including past Australian cricket captain Mark Taylor, NSW’s first State of Origin captain and Wests stalwart Tommy Raudonikis and other brilliant NRL players such as the Mortimer brothers. But the design and development of some really innovative hydraulic attachments suitable for the earthmoving, excavation and mining industries? Well, that’s a new one to me. 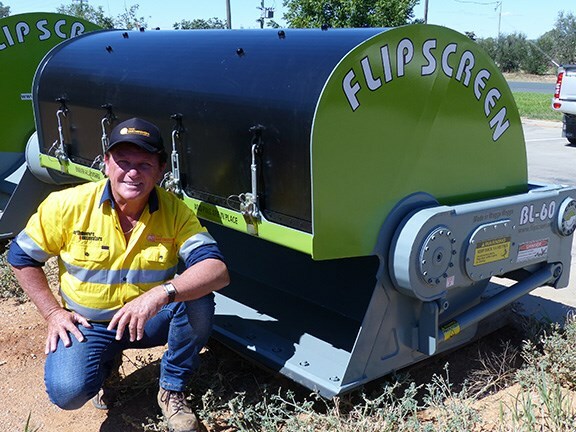 FlipScreen CEO and inventor Sam Turnbull owned a demolition yard in Sydney for some time before buying a farm near Wagga Wagga and starting to design the screening attachment he had been working on in his mind for some time. That was in 2002 and the company’s growth has been really amazing. Not only has Sam achieved his dream of designing an innovative hydraulic tool which has changed the industry, but he has developed, manufactured and marketed 15 models to 37 countries thus far — and has even bigger plans on the drawing board. The FlipScreen was inspired by Sam’s experiences in the demolition and excavation industry when screening material was done either by using an excavator or loader and feeding the materials through a huge and expensive screening plant, or by adapting excavator or loader buckets in some antiquated manner to produce little product for a major effort. When you meet Sam you immediately feel his energy and passion for what he believes in … he is well grounded, has a wealth of experience and understanding of the demolition, earthmoving, construction and mining industries and is one of those technical types who will talk you around in circles and leave you wondering, "What just happened?". His personal tour of the FlipScreen Wagga Wagga workshop leaves you in no doubt that this guy really knows what he is talking about. He has both practical and technical knowledge of the industry and product, is a visionary, has great passion and backs his product with his own cash and reputation. The FlipScreen is a portable mechanical screening attachment built for skid steers, excavators, wheel loaders, backhoes and telehandlers. It differs from other screens on the market in that it rotates instead of shaking. It can be attached via the quick-hitch adaptor head on any suitable material handling machine and can be changed in minutes without using any tools. The screen sizing on the high-volume screening buckets can be as small as mere millimetres or as big as 300mm. 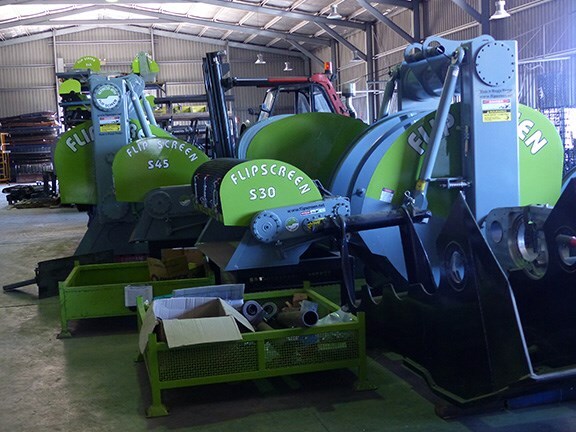 Sam says that the FlipScreen will inexpensively and efficiently sort and recover almost all aggregates onsite, making it perfect for industries such as civil works, construction, demolition, steel recycling, skip bins, waste transfer, quarries, mining, landscaping and railway ballast. The FlipScreen allows the contractor to screen two sizes of materials for a fraction of the cost of conventional methods — although it is more suited to smaller quantities than tens of thousands of tonnes. 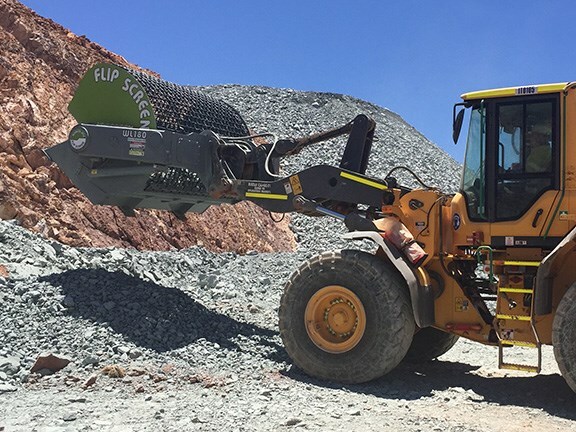 The current range of loader FlipScreens span from a small pedestrian Kanga loader right through to a 45-tonne mining-size machine with a FlipScreen that will pick up 4 tonnes at a time. These heavy-duty FlipScreens can be found in the mining and quarrying industry, scrap yards, foundries, recycling stations, aluminium smelters, waste transfer stations, landfills, construction projects and anywhere requiring robust machinery capable of developing a high volume, low cost production. Excavator FlipScreens are the flagships of the FlipScreen product line. These heavily built, high-volume, extremely robust rock and dirt screening attachments are suitable for almost all applications. They are built to withstand the harshest of rock and quarrying environments and Sam tells me they can withstand treatment from the harshest of operators. 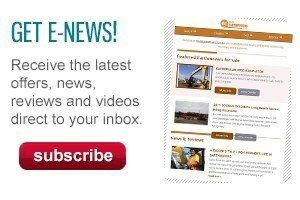 Sam says that some Excavator Flipscreens used in scrap metal and foundry applications have seen returns of full payback in as little as three and a half weeks. FlipScreen international sales manager David Barkla, reviewer Ron Horner and Kennedy Bros Earthmoving operator Nick Ambler. The FlipScreen has been a huge success in the market and, after only 12 years of operation, is now sold to 37 countries. The company currently manufactures 15 models of the Flip Screen and a new product, the Crusher Bucket, is planned. Sam tells me that his company now spends close to 20 percent of turnover on research and development, which has underpinned the success of the product. "Freight and logistics is an advantage for us from our Wagga Wagga workshop as we can readily service major markets in Sydney and Melbourne and any place in between," Sam says. 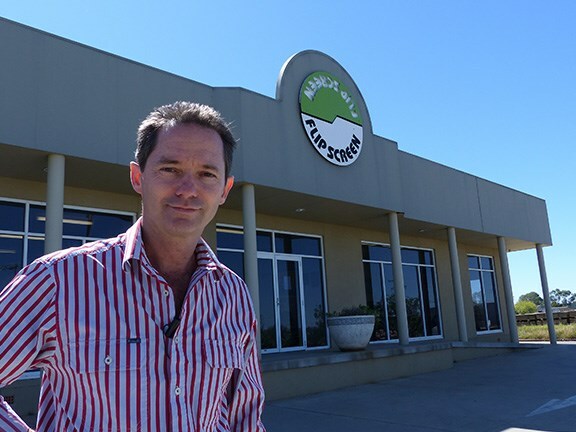 "It takes 31 days for one of our containers to be shipped from our Wagga Wagga factory to our facility in Dallas, Texas, so we are virtually as close to our international markets as we would be if we were in Sydney." He says Wagga Wagga provides them with everything they require. "There is zero frustration here," Sam adds. "Beautiful country fresh air, no congestion, plenty of good quality restaurants, numerous top-quality al fresco cafes … and that equates to a great lifestyle. I really like the feel of the place." On my part, I have to say that of all the times I have been in Wagga Wagga either playing rugby league, working or just passing through (and they have been many), I have yet to see the town in a depressive major slowdown. The town seems to be one of the well positioned and organised inland cities that seem to handle economy downturns with ease, and even when drought hits the rural sector, the light industrial and construction side kicks in and the town survives. Sam’s FlipScreen operation has a couple of aces up its sleeve and a big "Watch this Space" sign just dangling out there for the smart observer. First, they are well on the way to producing the largest mobile screening bucket ever made — a 45,000-tonne-per-day FlipScreen mounted onto a 200-tonne Le Tourneau Loader. 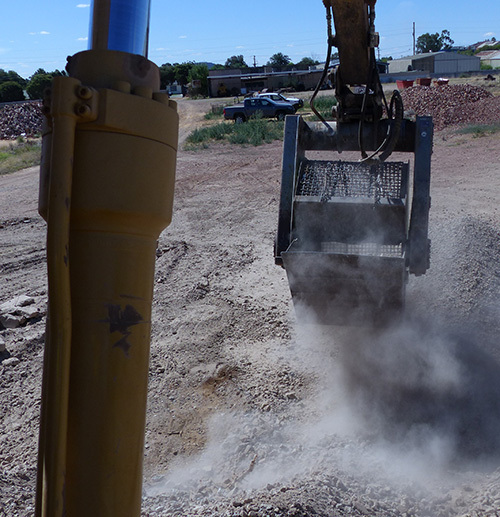 This screening bucket has the capability to change the way some mining operations view materials previously classified as "contaminated or unusable". With those production rates some marginal operating mines throughout the world could turn their operations into a profitable exercise. The other item which has the industry talking is what Sam calls his ‘Smart Valve’. Previously, if you had an attachment and you wished to swap it between similar but different-sized machines — for example a 20-tonne and 30-tonne excavator — you would have to adjust the flow and pressure from the hydraulic pump feeding the auxiliary lines to the attachment. This is not convenient on many occasions so operators tend to ignore it and later pay the penalty with costly repairs. This Smart Valve, on the other hand, is fitted to the hydraulic attachment and automatically adjusts the flow and pressure from the feed machine to suit the attachment. "I needed a valving system which could accept any flow and pressure, any actuation, on virtually any hydraulic system," Sam says. "I took my problem to several major hydraulic companies who ran me around in circles and failed to see the objective, which was to manufacture a valve that would do everything I had planned. "Frustration set in and I decided I could tool up my workshop and start designing and manufacturing a valve myself —and have control over my products and quality to boot," he says. The view from the 20,000-hour Cat excavator with the FlipScreen fitted. I had the opportunity to demonstrate a six-year-old FlipScreen on a 20-tonne Caterpillar excavator whilst I was in Wagga Wagga. 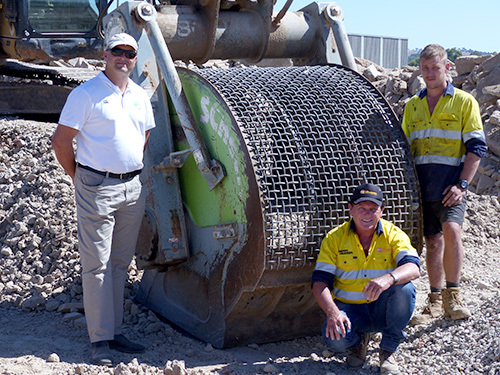 Kennedy Bros Earthmoving of Wagga kindly supplied the machine along with operator Nick Ambler, who gave us the run-down on the FlipScreen and just what it has done for the business. "The old Cat has 20,000 hours on it," Nick says. "She was just about ready to trade or trash when we got this FlipScreen. The boss decided to give the contract crushing a bit of a go and here we are six years later and the screen and the old digger have just kept on going. 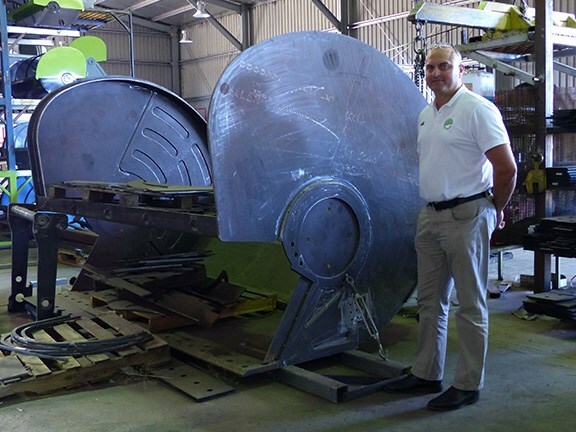 "Down here we have numerous council and private run operations where scrap, concrete and bricks are recycled and we have the contracts to keep the product moving for on-selling and recycling," Nick adds. "We don’t let the jobs get out of hand and keep our eyes on the quantities so we can monitor and keep abreast of the market and not let the dumps get into the many thousands of cubic metres at any time." During my demonstration I found you could push out about 80 tonnes per hour (50 cubic metres) using a 35mm screen, creating two products of minus-35mm and oversize. Not record-breaking, but when you examine the alternative of mobilising screening plants, loaders and running costs you seriously have to have a look at this. "The Cat owes a lot to the FlipScreen," Nick says. "She was destined for the retirement heap and now has a new lease of life, and this type of work is not hard on the old girl. "The screens are changed in about two minutes without the intervention of tools; hook up your hydraulic hoses and away you go," he says. "The FlipScreen is simple and effective and, most of all, has made our operation extremely profitable, so you can’t ask any more than that." After viewing and operating the Cat and the FlipScreen and assessing the costs involved I can only agree to agree … the FlipScreen is a brilliant hydraulic attachment that will keep your range of earthmoving equipment multi-functional at little cost and creating some pretty healthy profit margins. FlipScreen is another great Aussie innovation and ready to take on the mining industry worldwide. Remember that 45,000-tonne-per-day screen on a 200-tonne Le Tourneau Loader? I’m keeping an eye on that one!